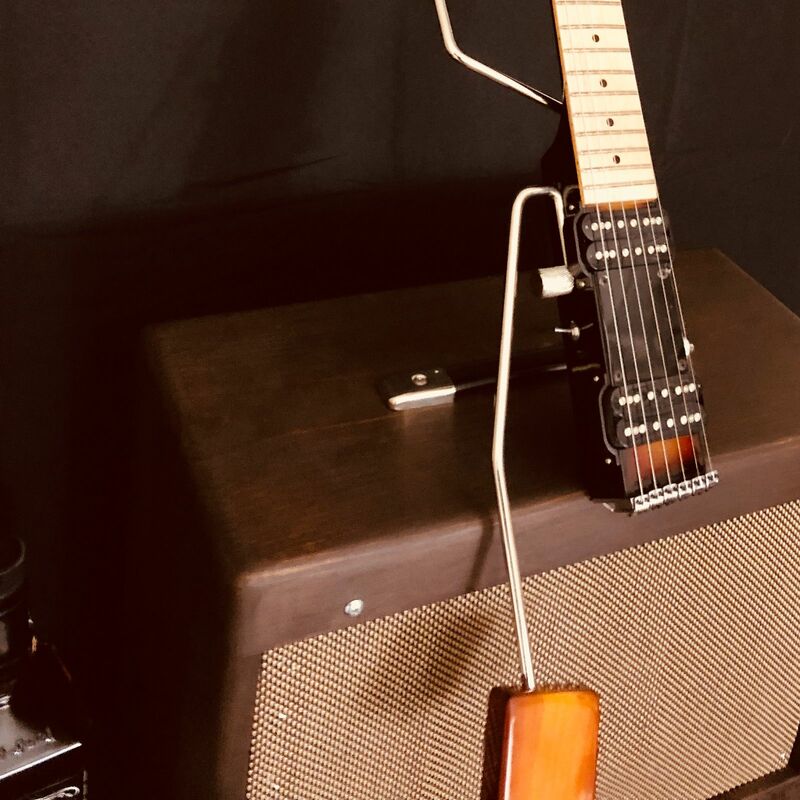 Guitarists who travel a lot and want to take an instrument along for the ride - but don't want to risk damaging that prized vintage Strat - might find themselves turning in the direction of a scaled down stand-in. 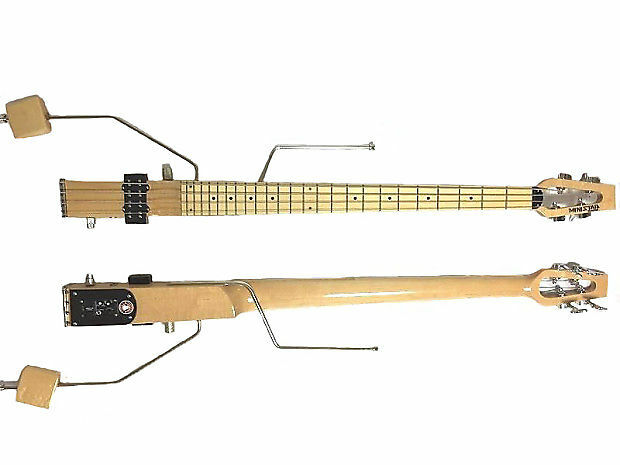 Such solutions come in many different shapes and sizes - from full size instruments with parts that collapse (like Daniel Mapp's Jetson travel guitar concept) to models with a shortened neck and small bodies (such as Martin's Backpacker) to strange-looking beasts with tuners positioned in a hollowed out section of the body (like the Traveler's Speedster). 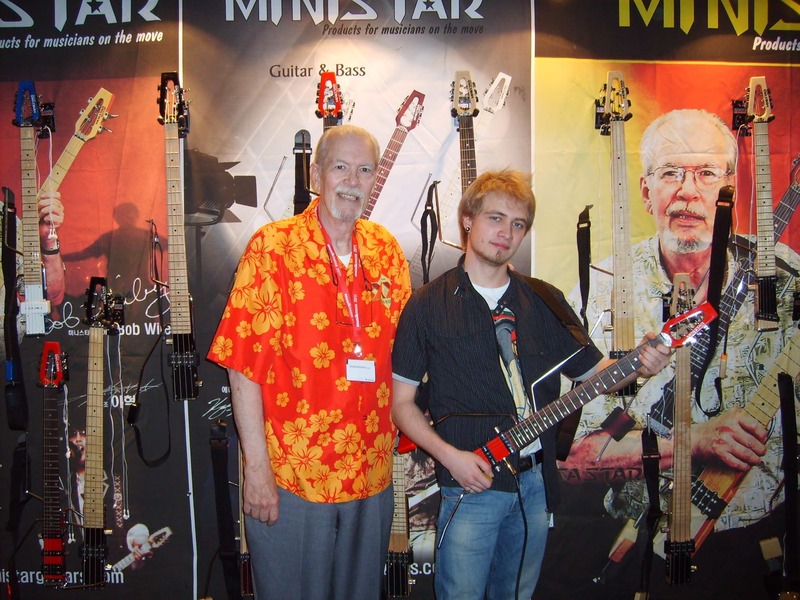 Bob Wiley's Ministar guitars, though, are essentially a bunch of necks with pickups. While there is a model with a shortened 19-inch scale neck, most of the odd-looking electric, acoustic and bass guitars sport full length necks and, says Wiley, play and sound just like the big brand models, but at a fraction of the price - and a fraction of the size. 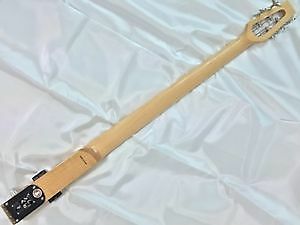 In order to string pick on the road, players can expect to have to make quite a few sacrifices if opting for a travel guitar. That might be a shortening of the scale, a compromise in comfort or a weakening of the sound. Wiley has put his significant creative pedigree behind a series of minimalist guitars that are said to be easy to play, oddly comfortable and where tone is king. 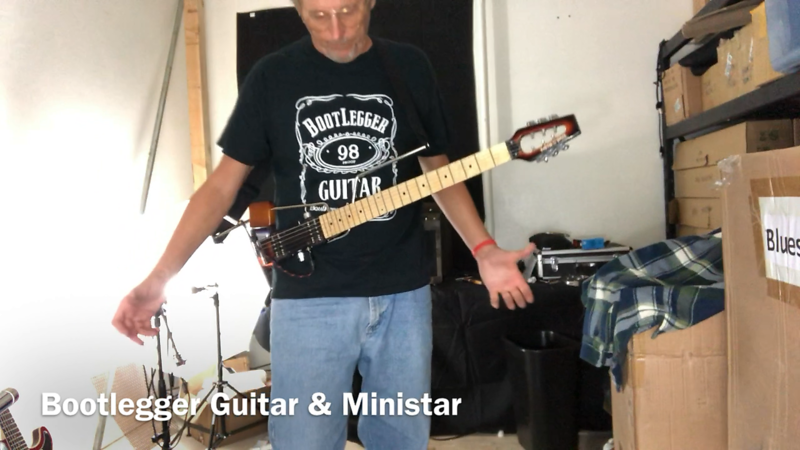 Before taking a closer look at what the Ministar guitars have to offer, let's take a quick diversion into Wiley's past innovations. Wiley's interest in all things used to create modern music started at an early age, he accompanied his father to his very first NAMM in 1948. 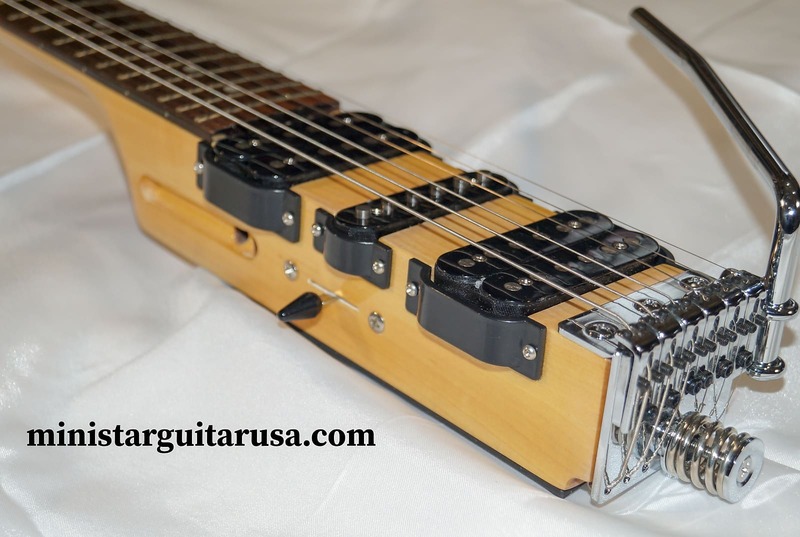 He dipped his toes in design and development while working on the Guitorgan guitar synth in 1967. 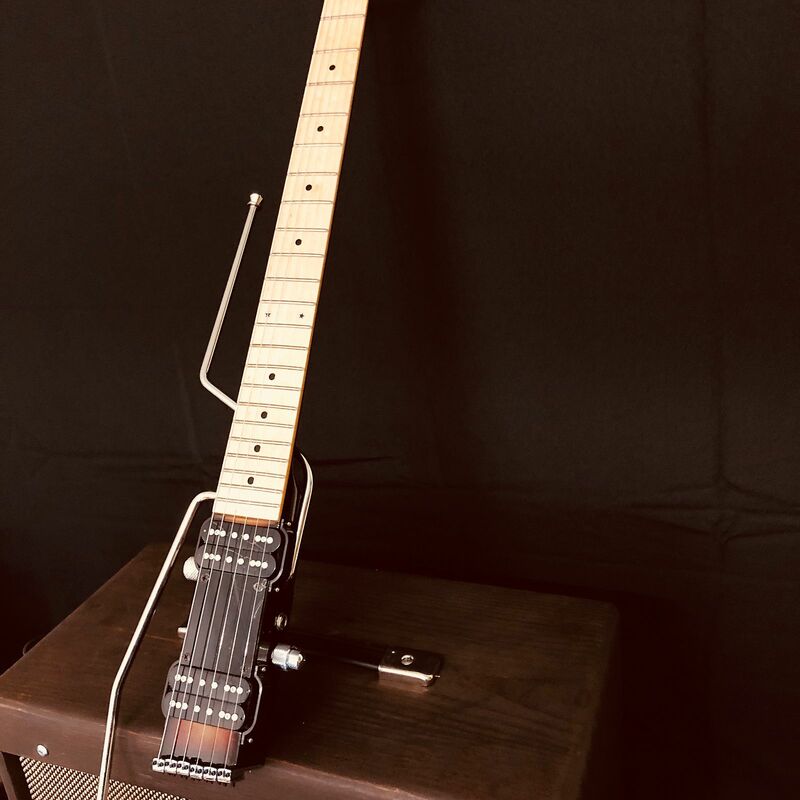 "It used frets cut into segments, with a wire running from each segment to organ electronics that we eventually located inside the body of the instrument," Wiley told us. "Contact between the string and the fret turned on an organ note. You had to learn to play all over again to get the best results. Needless to say, bending strings was not possible, and contributed a large part to its limited success." 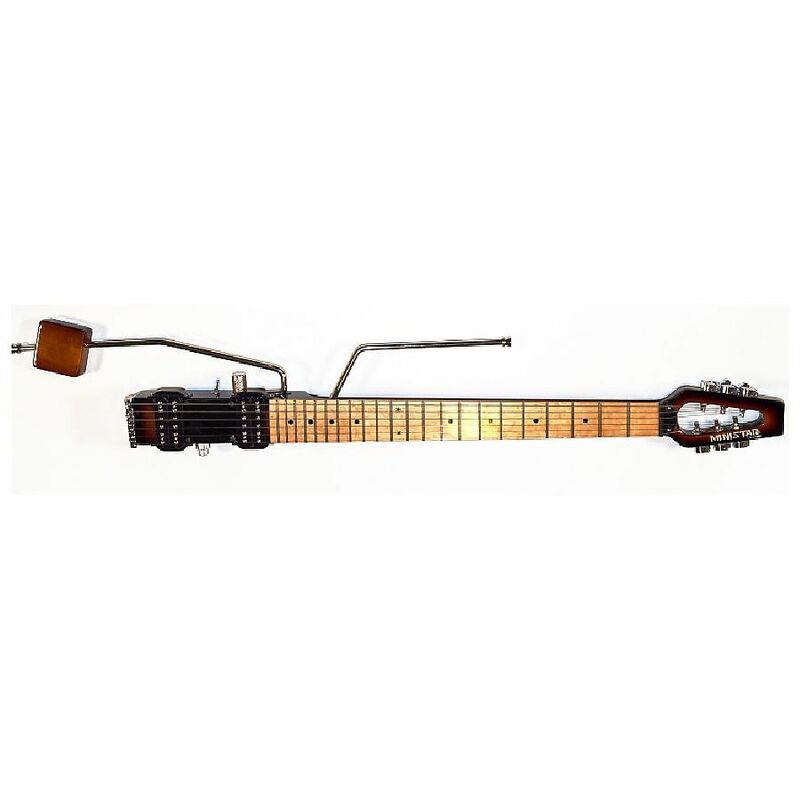 Design of the first Auto Orchestra followed in 1973, which put a host of rhythm accompaniment at the guitarist's disposal - not unlike the drum, bass, fills, intros and endings available to keyboard players. Wiley has designed numerous products for guitar and keyboard players in the years since, including the Orchestrator, some One Man Band products (like the OMB2 and the AO 16R), the Programmer 24, and the Instant Harmony. For his latest creations, Wiley has left the old argument about which guitar shape is the best well and truly behind. 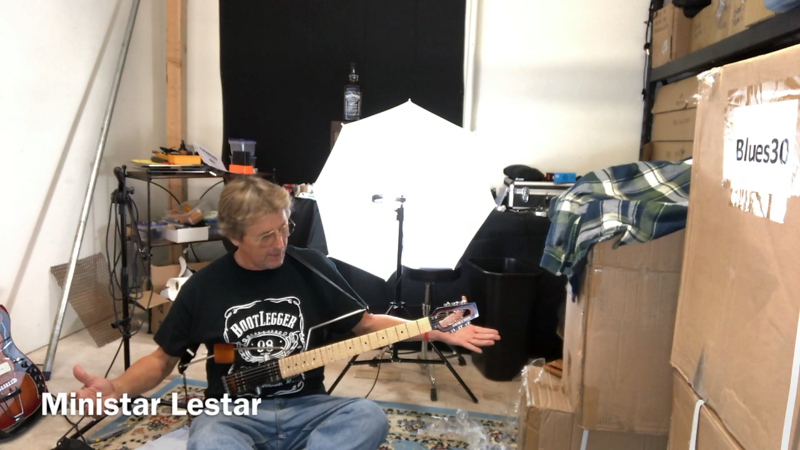 He says that Les Paul's led the way and proved that an amplified guitar didn't need a full body to produce great tone. 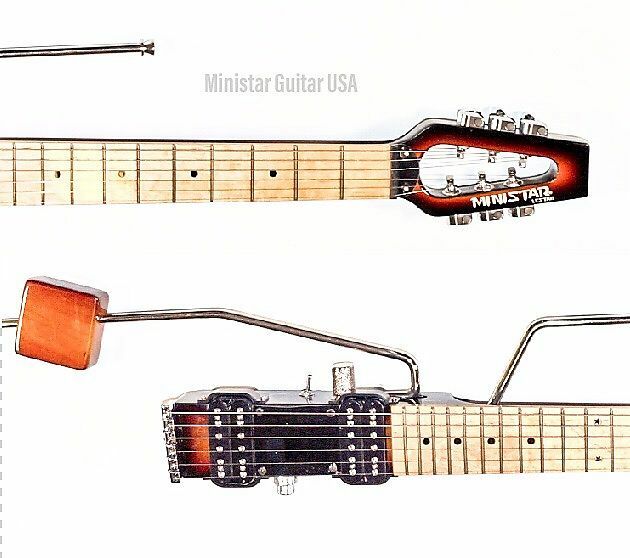 The design of the Ministar range takes this a step further with guitars that look like they've just lost an epic battle and been chopped to pieces - with only the neck and pickups remaining. 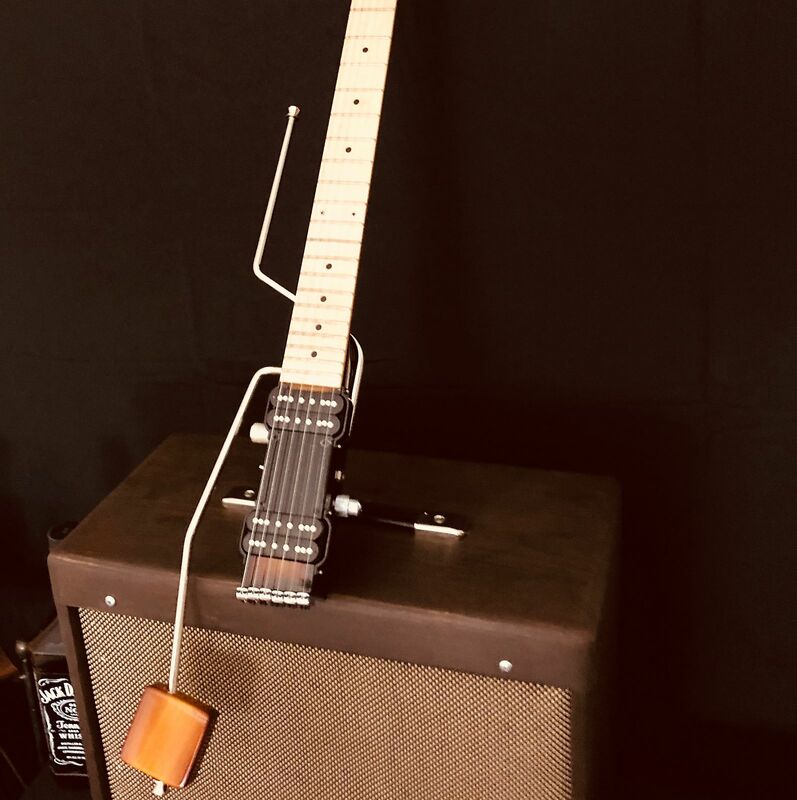 After exhaustive spectrum analysis and blind model comparison testing, Wiley found that body shape is of little consequence to the most important element of any guitar - its tone. 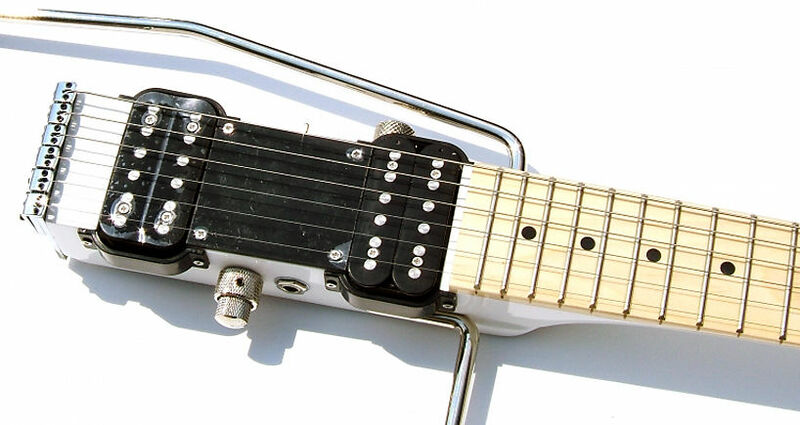 Consequently, much of what we've come to think of as a guitar body has been deliberately left out. 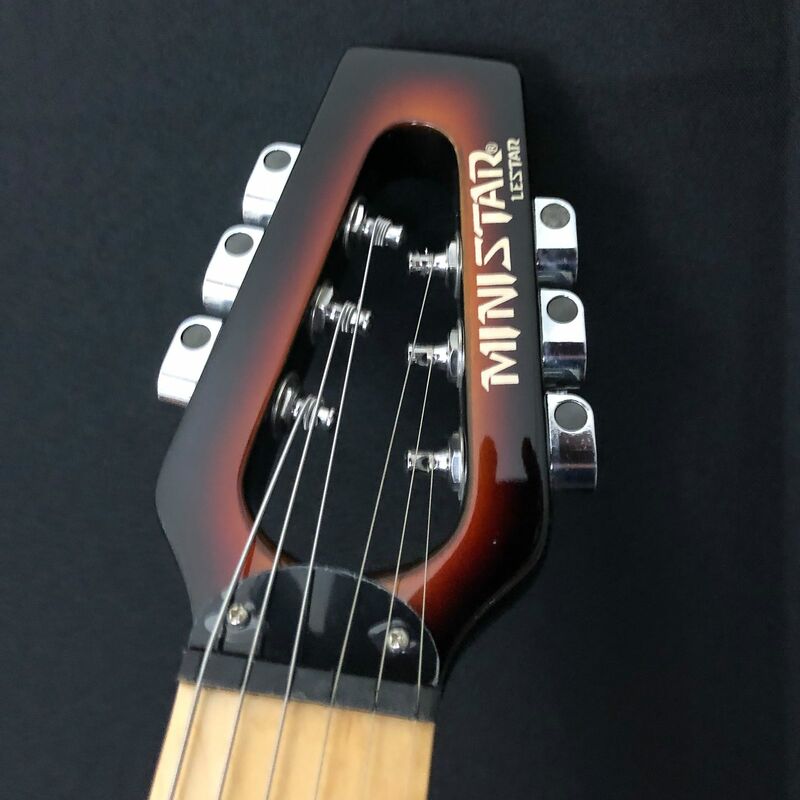 All Ministar guitars are made from hard-rock maple and feature a unique Ministar head featuring die cast metal machine heads and precision tuners that's claimed to give the guitars better sustain and more strength than the industry big boys. 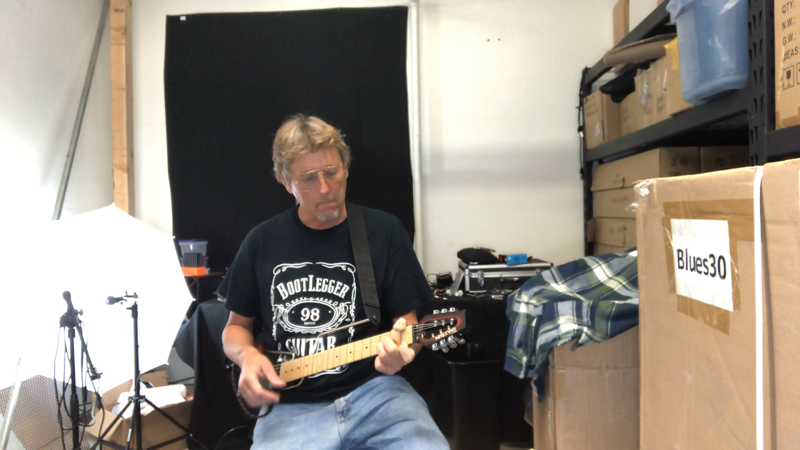 "Currently, with few exceptions, neck/headstocks are made either using an undercut such as a Fender, or a Gibson-like 'scarf' joint, wherein the headstock is a separate piece of wood glued onto the neck at an angle," explains Wiley. 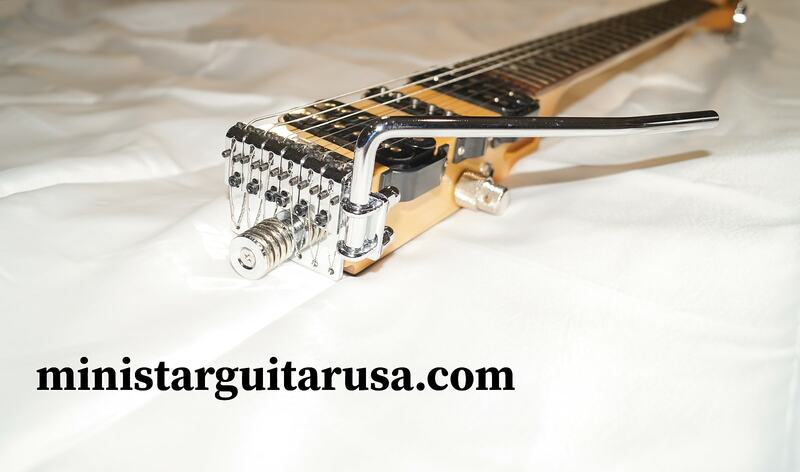 "The Fender design does allow the wood grain to extend to the end of the headstock, but in order to obtain enough bearing on the nut of the guitar, Fender ads T-shaped hold-downs that some of the strings must be placed under. The Gibson type obtains the bearing on the nut by gluing two pieces of wood together at an angle. 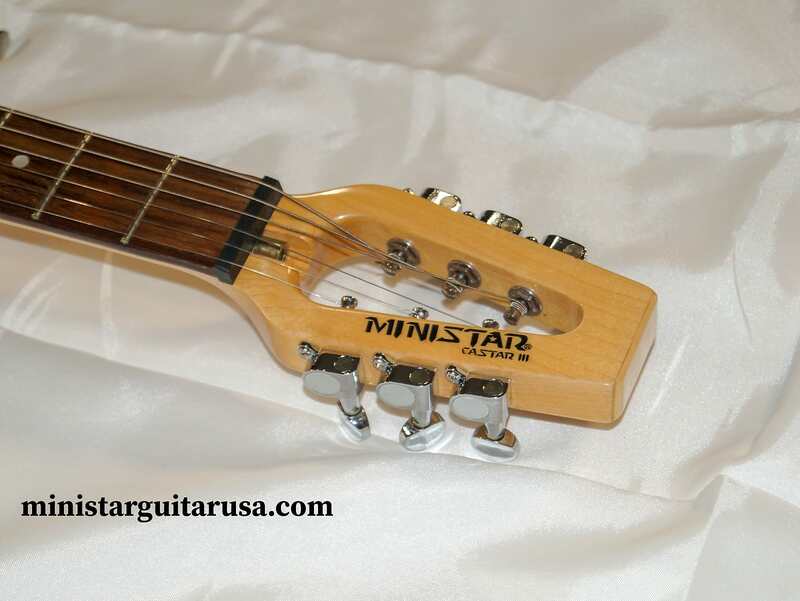 The Ministar design allows the wood grain to extend in a straight line from the top of the fingerboard to the end of the headstock, providing a solid platform on which the strings can vibrate. 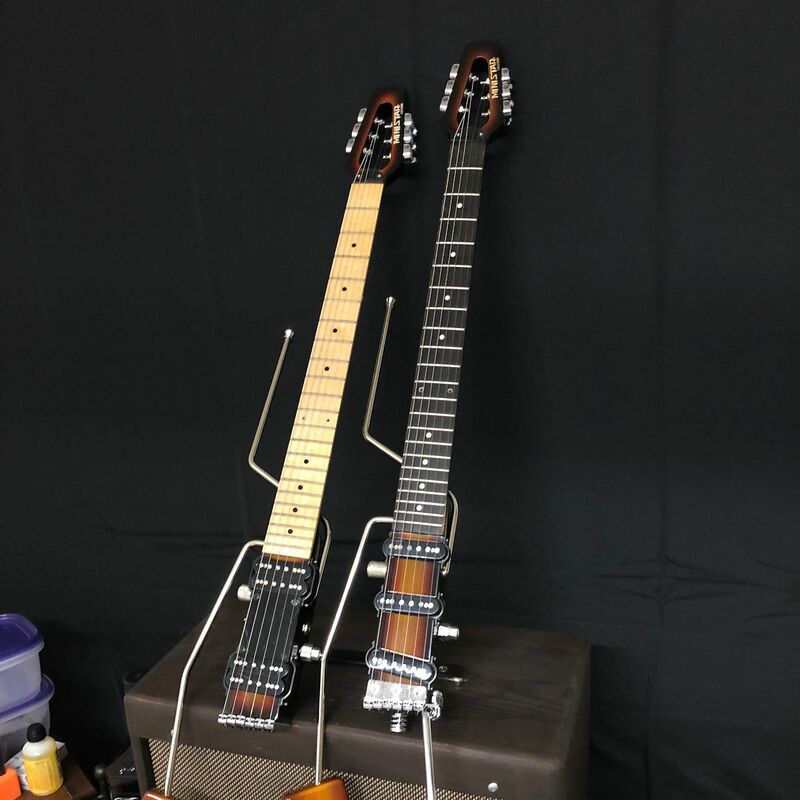 There is a cutout area in which the tuning machines are mounted with the key knobs pointing straight back from the headstock. This places the posts of the tuning machine in a position that is lower than the level of the nut, providing the bearing needed in the nut to ensure rattle and buzz-free performance." 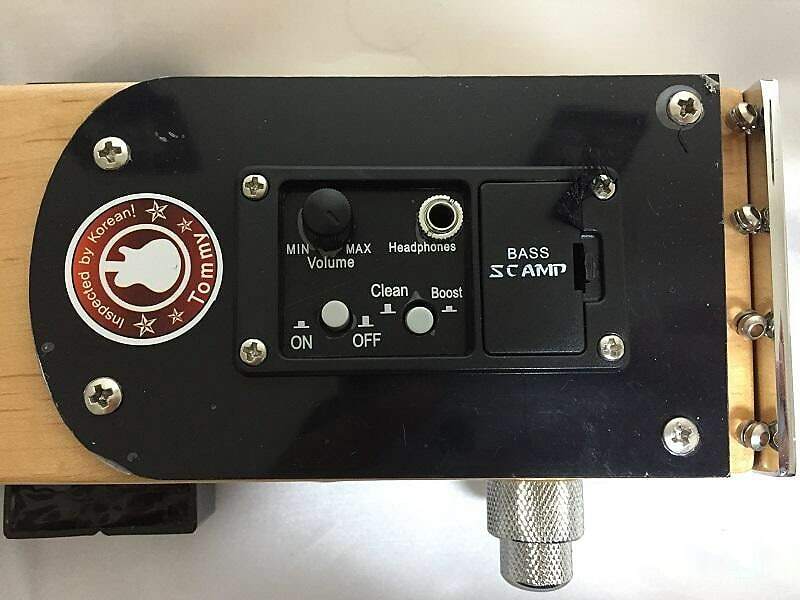 At the other end of a Ministar guitar, you'll find a battery-powered headphone amp built into the 1.75 inch (for electric) or 2 inch (for bass) thick business end called a Scamp (which stands for Self-Contained-Amp). It has its own distortion circuit for electrics and EQ/contour boost for bass guitars, and can be used as a direct output for a monitor in stage setups. A set of quality earbud-type phones are also supplied with every instrument. 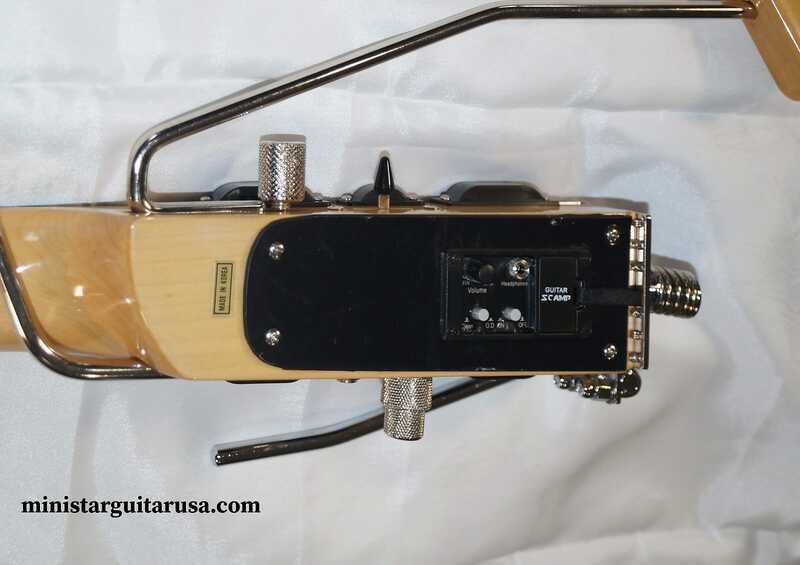 Those strange looking metal antennae pointing up and out don't, in fact, pick up Jazz FM but are slotted into the instrument to enable players to attach a strap to the guitar, the left arm also sporting a useful adjustable wooden comfort plate, which mimics the area on a standard guitar often worn down by the player's picking arm. A further rod is included for those who play while sitting. 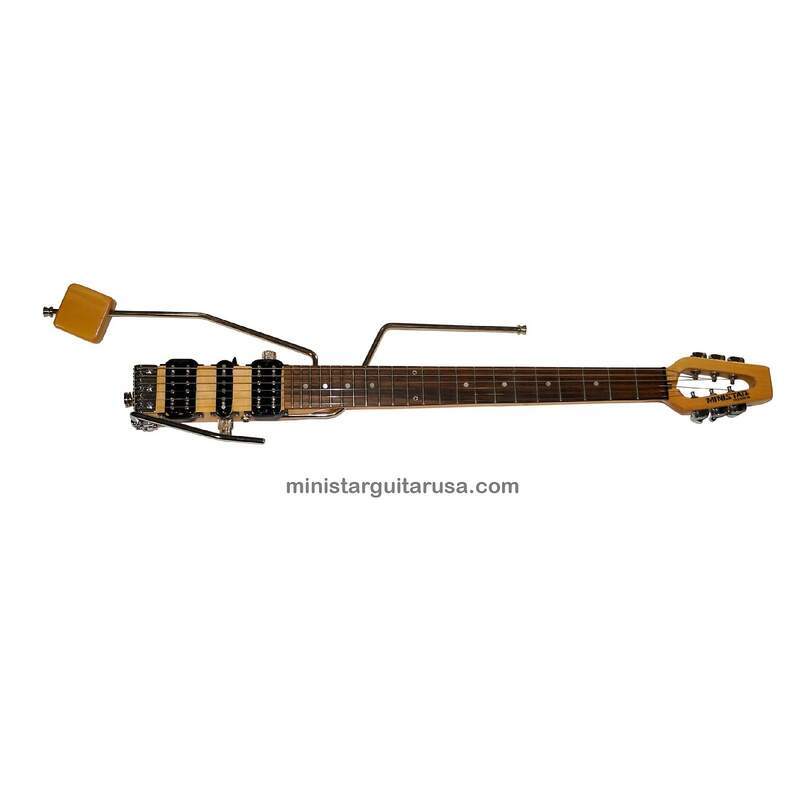 The electrics on the business end vary according to model but you can generally find a volume knob paired with a tone knob, and pickup selectors of some sort - a Fender-like 5-way pickup switch on a Castar and a 3-way selector on a Lestar, for instance. 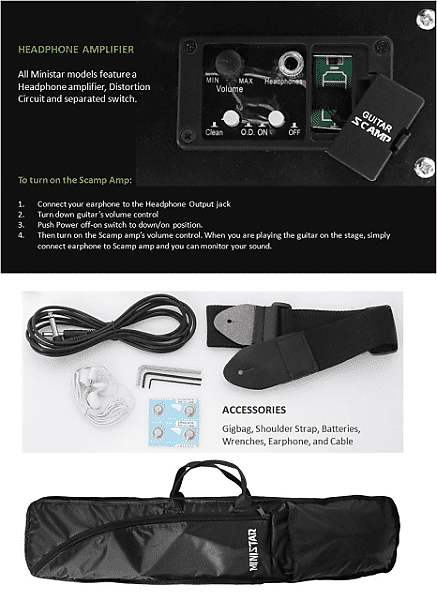 The instruments are wired up to an amp via a 0.25-inch output jack on the bottom side. 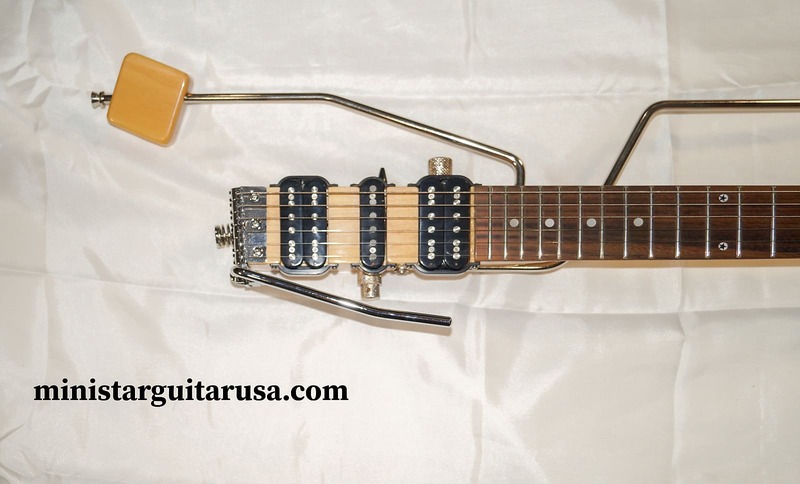 the company's own single coil or humbucker pickups have been made to the same configurations as the instruments from which they get their names - although Wiley admits that his technicians do "put a few extra turns of wire on each pickup to give it an extra bit of output, without becoming muddy." Some models have Maple fingerboards, others have Rosewood, but all feature German Silver (nickel/silver alloy) frets. 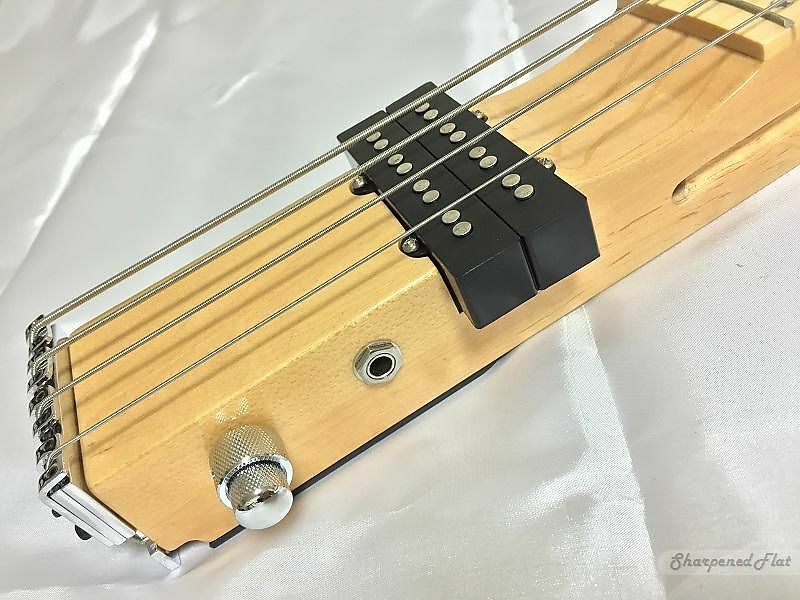 Also common to the electric and bass models is an adjustable nut and a unique Ministar adjustable bridge with buzz-proof saddles, with which a player can fine-tune a given instrument to preferred tastes. 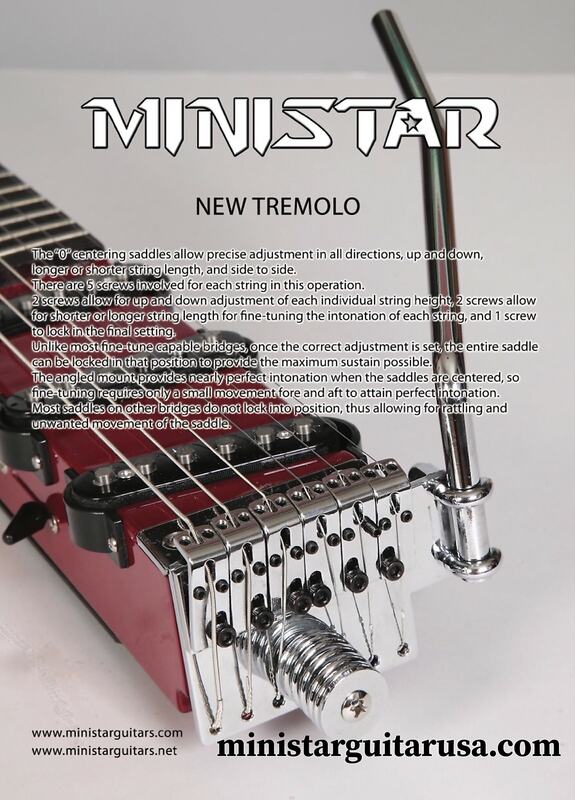 "Ministar allows the user to address critical settings that will determine the overall performance of the guitar or bass," said Wiley. 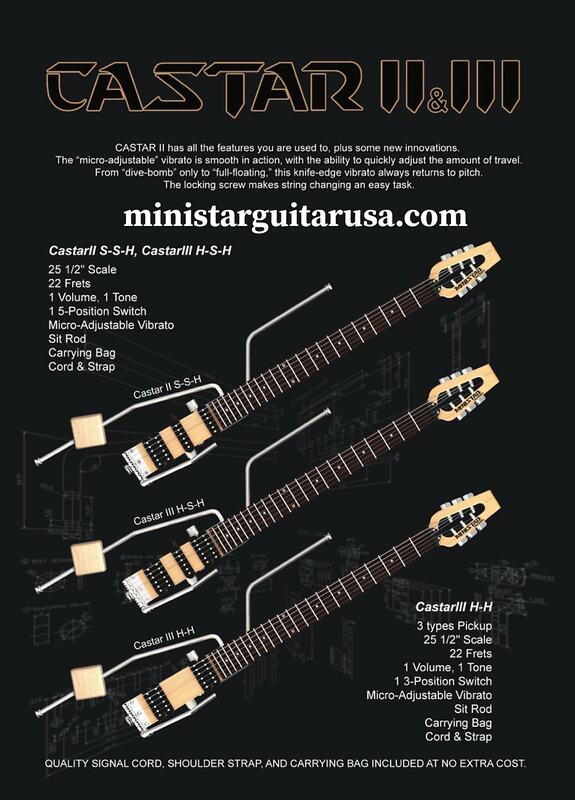 "These are the curvature of the neck, the string height above the frets, the clearance between the strings and the first fret, the string spacing, and the string length for proper intonation, and once set, the bridge and all of its components can be locked. This provides a solid mass to increase sustain and eliminate any possibility of rattling or buzzing, which is very common in many upscale electrics. " 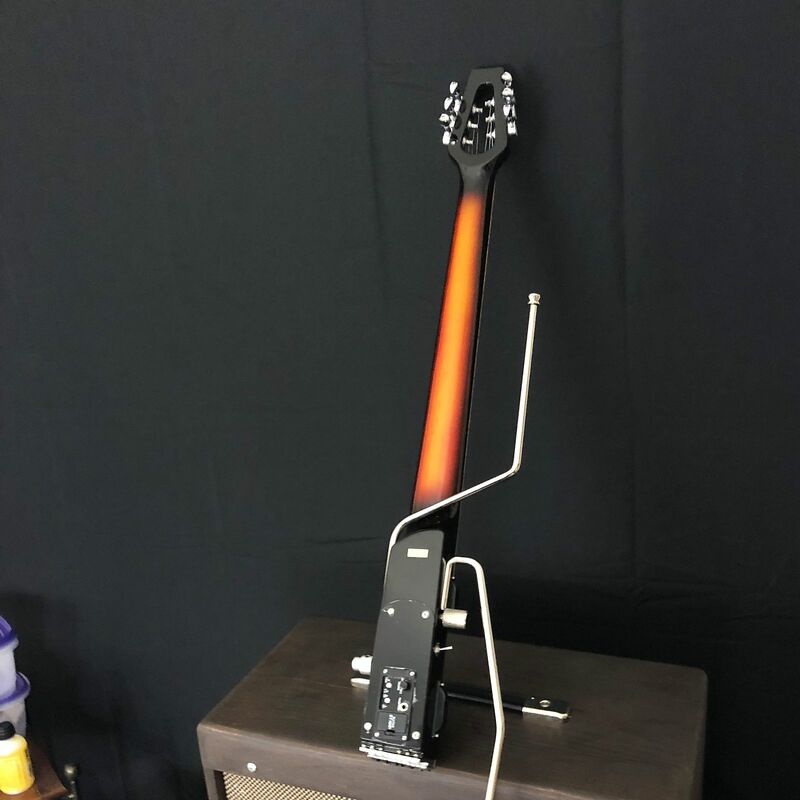 Models featuring a whammy bar have an exposed vibrato system that allows for easy adjustment between locked and floating, and even caters for the player to decide the placement of the fulcrum point of the bar itself. 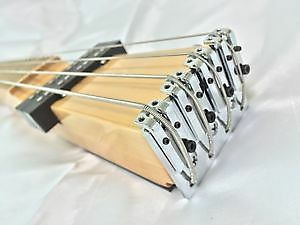 If your budget doesn't run to a gorgeous Veillette double neck guitar, the Twinstar connecting rod allows you to pair up any two compatible models. 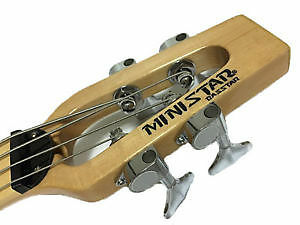 Once the need for double the pleasure has passed, each Ministar model can be disconnected from the other and used as individual instruments again. 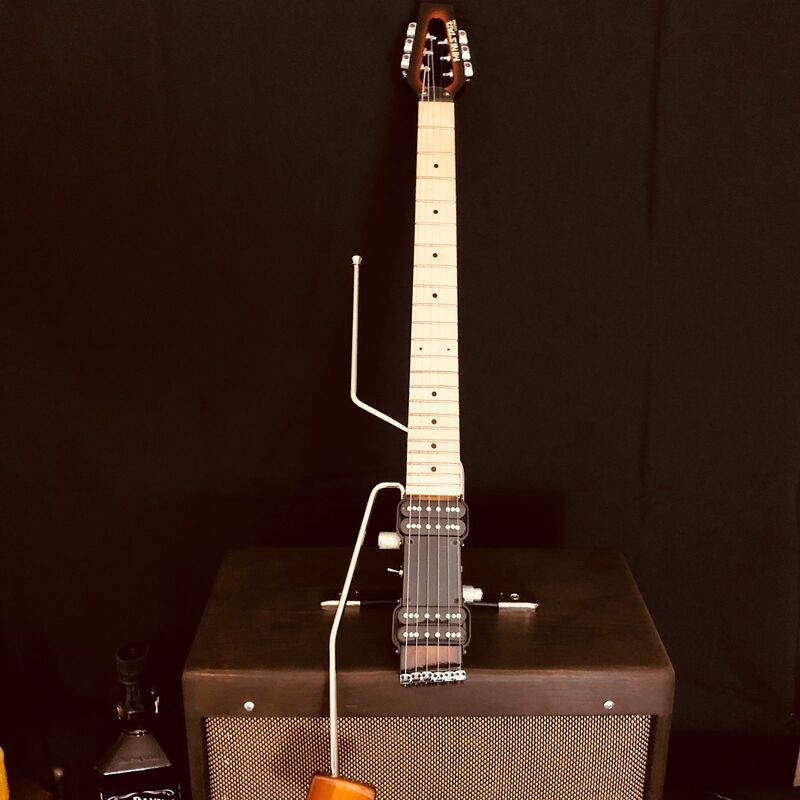 There's also a stand-up kit available that can turn any of the full 34-inch scale four or five string, fretted or fretless Ministar bass models into an upright slap bass for that Stray Cats vibe. Disney Club but makes it "sound just like a big Dreadnaught acoustic guitar, but without feedback." Wiley told us that the 2-watt, battery-operated folding speaker with built-in frequency-sensitive light show was originally intended for use with an iPhone but just happens to have the same thickness as a Ministar guitar. 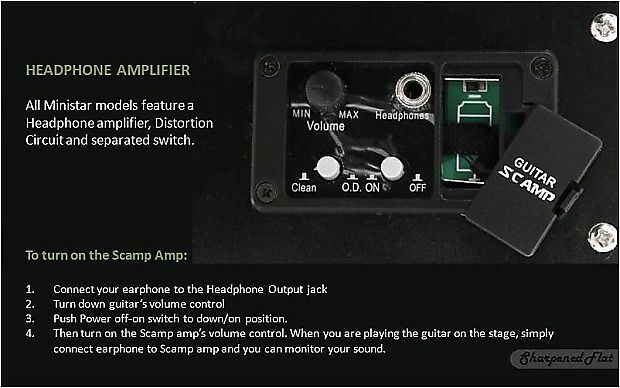 It outputs at about the same volume level as an unamplified acoustic, although with slightly more treble and less bass end, and is driven from the guitar's onboard headphone amp, which of course also makes the distortion circuit available. 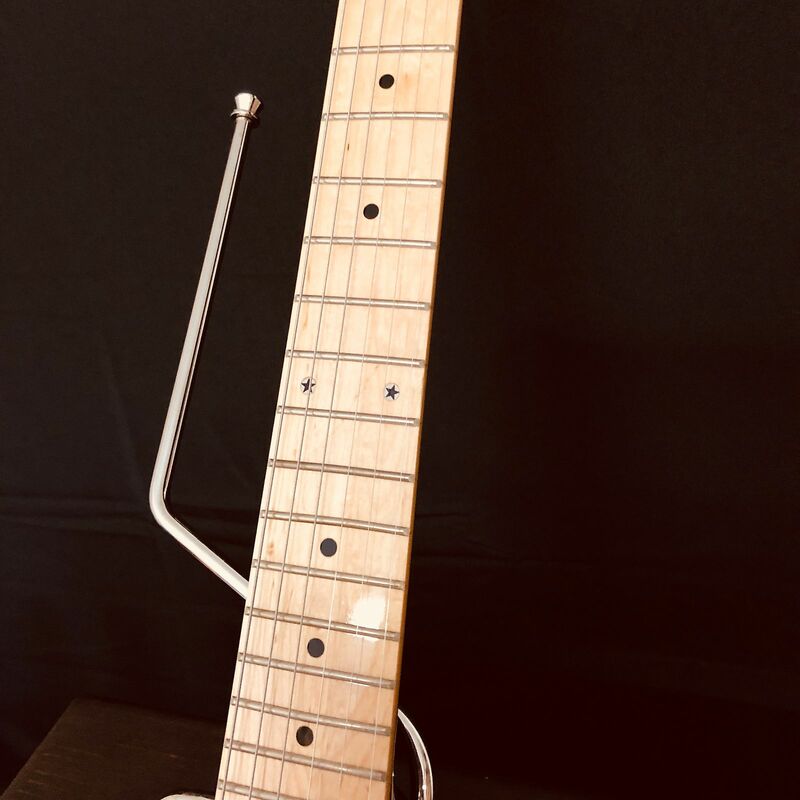 Then there's the Acoustar travel acoustic - available as a full-sized or three quarter model - with a neck that slides inside the body for transport. "There is a single bolt located under the heel of the neck," Wiley says. "A simple ratchet wrench is included that allows you to tighten the neck into position (indicated by a mark on the side of the neck) or loosen it so it can slide inside the body. Detuning is not necessary, and with broken-in strings, it will return to pitch. 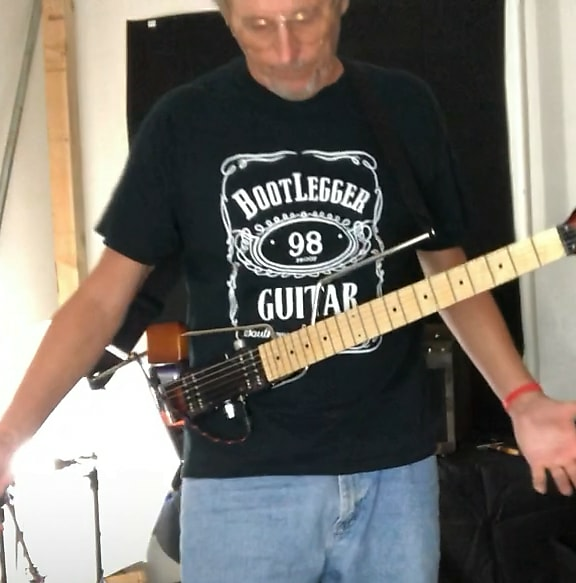 It takes about a minute to put on the capo, put the padded velcro wrap around the neck, loosen the neck, gather the strings and place in the smaller velcro wrap close to bridge, and then slide the neck inside the body into the cradle. The process is reversed to re-assemble the guitar. 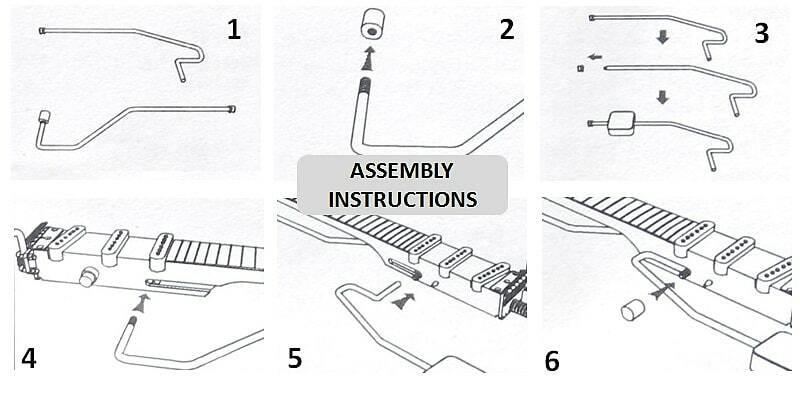 A backpack is included, and it will allow you to carry the Acoustar disassembled or assembled."